On January 1st, 2019, AXA Next is officially born. 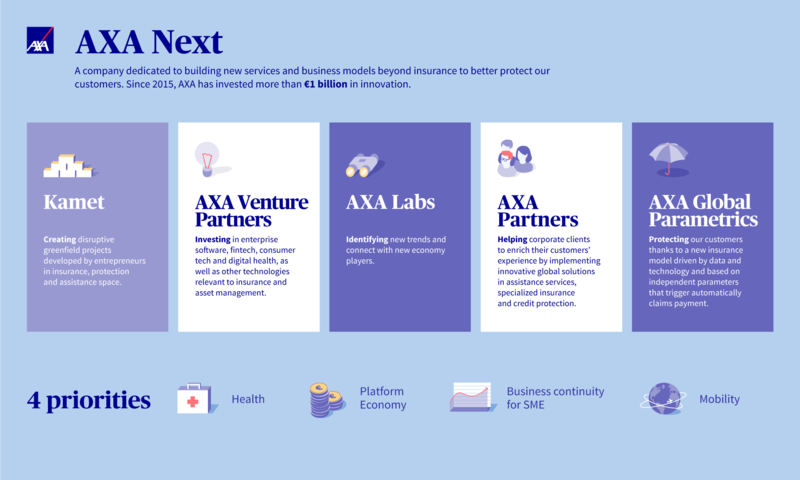 This new company was created within AXA with one single objective: build new services and business models, going beyond the insurance coverage, to become a true partner of our customers. The new structure allows us to benefit from a dedicated organization and resources as well as new ways of looking at business developments. In a world impacted by major technological and societal disruptions, the expectations around protection are increasing dramatically. I am convinced that AXA Next and their great innovations position AXA to meet the needs of our customers, and become a close partner in their lives. Kamet creates disruptive greenfield projects developed by entrepreneurs in insurance, protection and assistance space. The goal is to launch, incubate and build new innovative companies by working with the most talented entrepreneurs and providing them with the resources they need to grow and realize their ambitions - 12 companies have been launched generating over 300 new jobs. 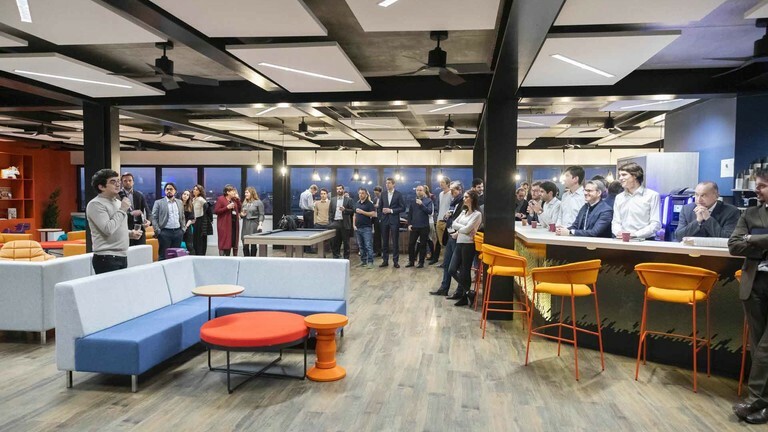 AXA Venture Partners invests in enterprise software, fintech, consumer tech and digital health, as well as other technologies relevant to insurance and asset management. The €600 million fund provides a unique network of start-ups – a diversified portfolio of some 40 start-ups as of today. AXA Partners helps its Corporate clients to enrich their customers’ experience by implementing innovative global solutions in assistance services, specialized insurance and credit protection. This global entity facilitates the large-scale implementation and development of our solutions throughout the world thanks to its significant distribution capacity. AXA Global Parametrics protects our customers thanks to a new insurance model driven by data and technology and based on independent parameters that trigger automatically claims payment. AXA has focused on services relating to improving access to care and improving outcomes. Teleconsultation is an example of this. Qare, a Kamet start-up, enables patients to receive medical advice remotely in 17 different fields and integrates doctors (more than 50,000 customers signed up). Thanks to AXA Partners, the company has also partnered with public authorities such as Hauts-de-France region to launch a pilot medical teleconsultation scheme aimed at improving access to healthcare in France and supporting the region in the fight against medical desertification. AXA acquired Maestro Health in February 2018, a US-based employee health and benefits platform and enhanced third-party administration company, that supports mid-size self-insured employers in managing the health and cost of their employees and families. Maestro Health offers a full set of services from onboarding and enrollment to claims and care management. More recently, AXA Venture Partners, lead a €23 million investor round in the French start-up Happytal, which offers concierge services at French hospitals. 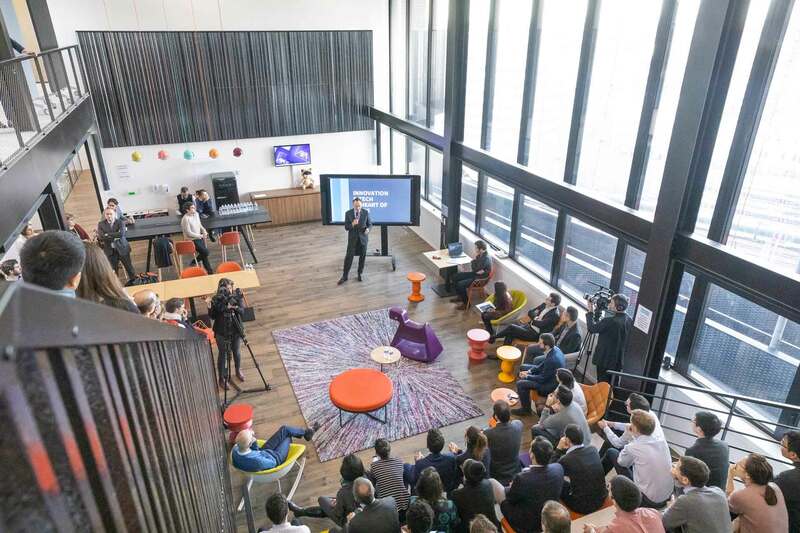 AXA supports a number of collaborative and new economy players. For example, the company provides basic social security to 150,000 Uber drivers and delivery partners in 25 countries - 100 million rides and deliveries were covered in 2017 and 25 million drivers / car-poolers that use BlaBlaCar in Europe are protected. Thanks to Kamet, we are also developing new insurance models such as Anorak Technologies, which has developed a platform to build the world’s smartest life insurance adviser and Setoo, that is helping online businesses to integrate simple insurance products tailor-made to the customer and automatically embedded into the customer journey. Following a cyberattack, the primary concern of a business owner is minimizing any disruption to business. In order to alleviate this problem, AXA Venture Partners has invested in a number of cybersecurity start-ups, including American start-up Security Scorecard, which provides the most accurate benchmark of security risk across the entire business ecosystem. AXA supports the mobility providers of today and tomorrow. For example, we have entered into a partnership with Navya, the leader in autonomous shuttles, to insure its customers and develop insurance products designed for autonomous vehicles. Another example of originality is the innovative product Fizzy, which insures against plane delays and is based on blockchain technology and parametric insurance. 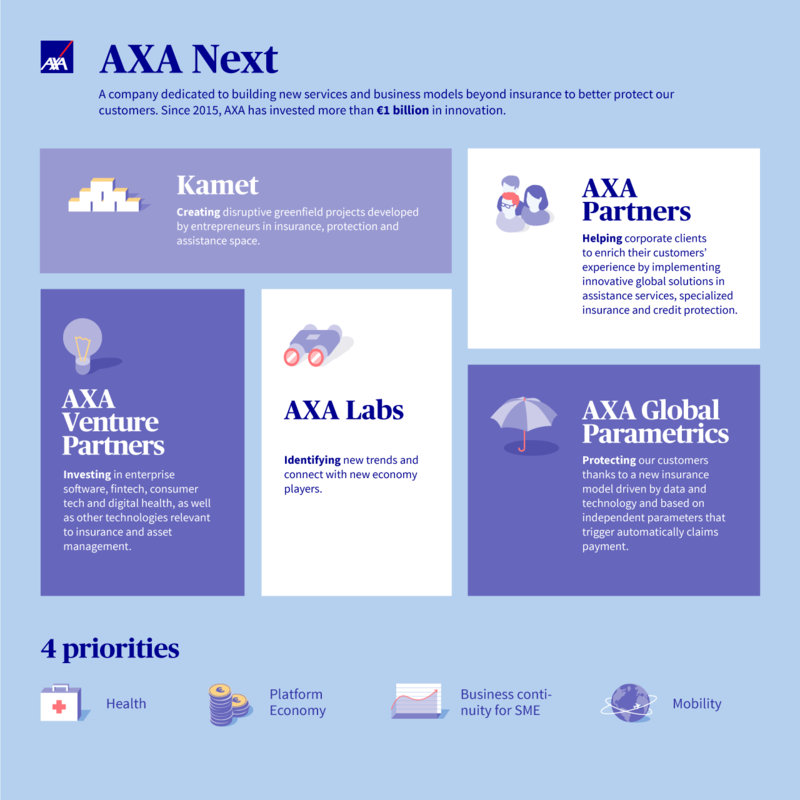 Through this new entity, AXA aims at speeding up the pace of innovation to be more than a payer of claims, becoming a true partner of its customers. Insurance will remain a core part of our proposal, but we will go beyond insurance by bringing new services and offer a more comprehensive answer to the evolving needs of our customers. With the diversification of its portfolio, AXA is relying on this new entity to find new growth territories for the Group in the years ahead.